Artists I Love | Tourmaline . I’ve been working on and brainstorming some surrealist work. Patterns. colors and reflections formed together in interesting ways. I’m calling the 2 current series – Reflections of Self, and Electric Sun and I’ll begin sharing some of them starting tomorrow. In honor of this current creative streak I want to highlight some artists that are inspirational, weird, surreal, and the like. Known on Youtube and through his adversarial work, Mike Diva is a pop culture king. First and foremost an art director, Aleia uses miniatures in conjunction with snails, food, and other every day objects to create dark, surreal narratives. Most recently she’s been working with Sam Copeland to create short music video clips for Aly and AJ’s new album. I’ve discussed Arthur Tress briefly in my ‘The History of Miniature & Toy Photography‘ post. To be honest until researching this post, I was largely unfamiliar with Tress’ entire body of work. An avid traveler, he created on the go, but even so, his work whether miniature, full scale, colorful or black and white, remains mysterious, surreal, and a tad creepy. What had already fascinated me prior to this post was his Teapot Opera and Fish Tank series’, and since his Hospital Constructions have become all the more intriguing. Learn more about Arthur Tress on his website – http://www.arthurtress.com/. Sandy Skoglund creates life size sets full of vibrant colors and repetition. She then photographs the sets with live actors. Her photos explore fears in an imaginative, in your face way, forcing the viewer to confront and explore what is before them. Learn more about Sandy Skoglund on her website – www.sandyskoglund.com/. Do you remember the I SPY books? Toys floating and falling in magical ways, with a list of things to find throughout the images. Well, those toys were carefully arranged and photographed by Walter Wick. Not only was he the artist behind the I SPY books, he also produced the images and text for Hey, Seymour!, Can You See What I See?, A Drop of Water, and Walter Wick’s Optical Tricks. Visit his blog to get a behind the scenes look at the creation of some of his stunning imagery on his website – http://www.walterwick.com/behind-the-scenes/ – and blog – http://www.walterwick.com/blog/. 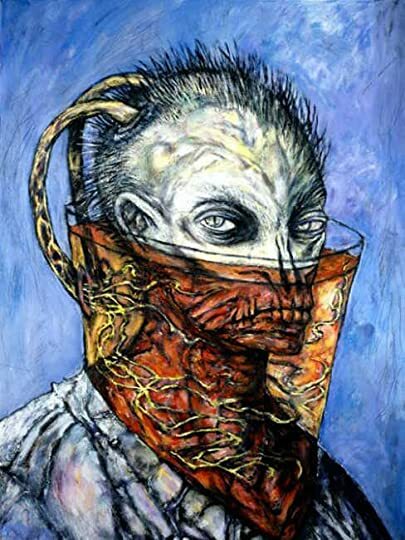 Known for his work on horror movies such as Hellraiser, Clive Barker is also an author and painter among other things. His Abarat novels are for young adults and he painted each of their numerous illustrations. His style draws you in in the intricate, sometimes creepy, compositions.